Family Dollar Stores, Inc. (FDO) operates a chain of self-service retail discount stores primarily for low- and middle-income consumers in the United States. This dividend champion has paid dividends since 1976 and has managed to increase them for 38 years in a row. The company’s latest dividend increase was announced in February 2014 when the Board of Directors approved a 19.10% increase in the quarterly dividend to 31 cents /share. The company’s peer group includes Dollar General (DG), Dollar Tree (DLTR), and Wal-Mart Stores (WMT). The company has managed to deliver a 10.40% average increase in annual EPS over the past decade. Family Dollar is expected to earn $3.15 per share in 2014 and $3.51 per share in 2015. 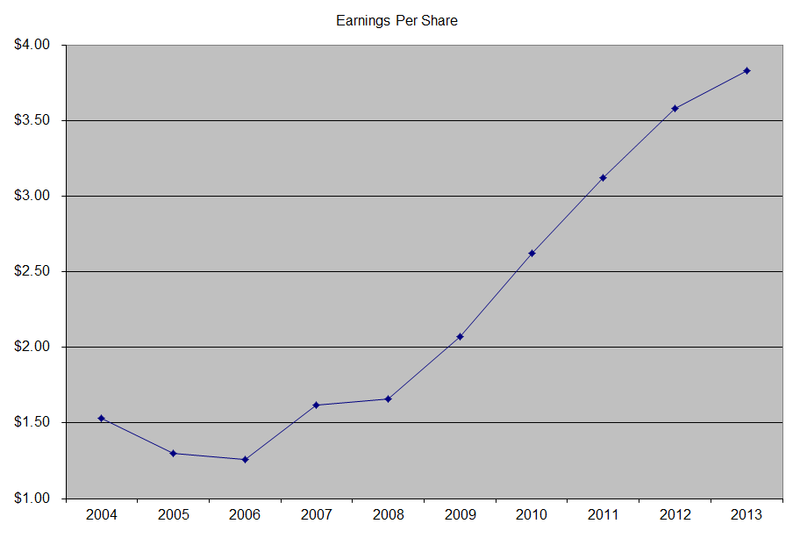 In comparison, the company earned $3.83/share in 2013. Family Dollar has a record of consistent share repurchases. Between 2004 and 2014, the number of shares decreased from 172 million to 115 million. The annual dividend payment has increased by 13.60% per year over the past decade, which is higher than the growth in EPS. 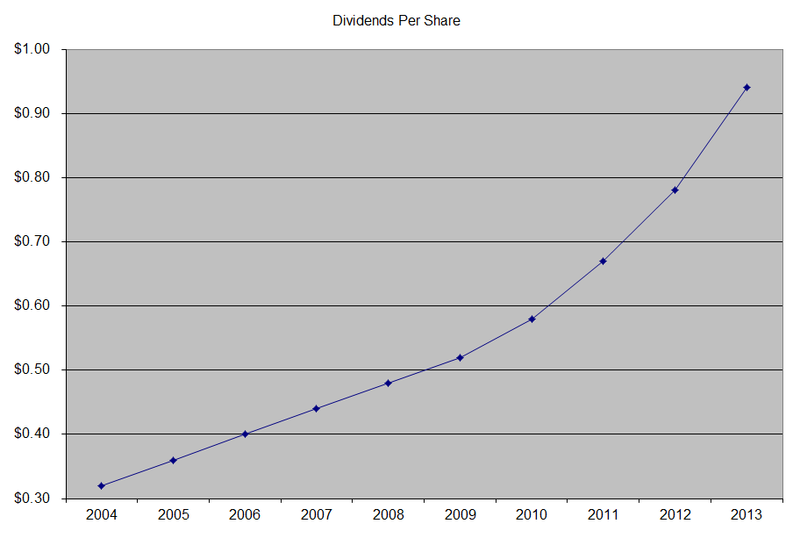 A 13.60% growth in distributions translates into the dividend payment doubling every five years on average. If we check the dividend history, going as far back as 1985, we could see that Family Dollar has actually managed to double dividends every six years on average. 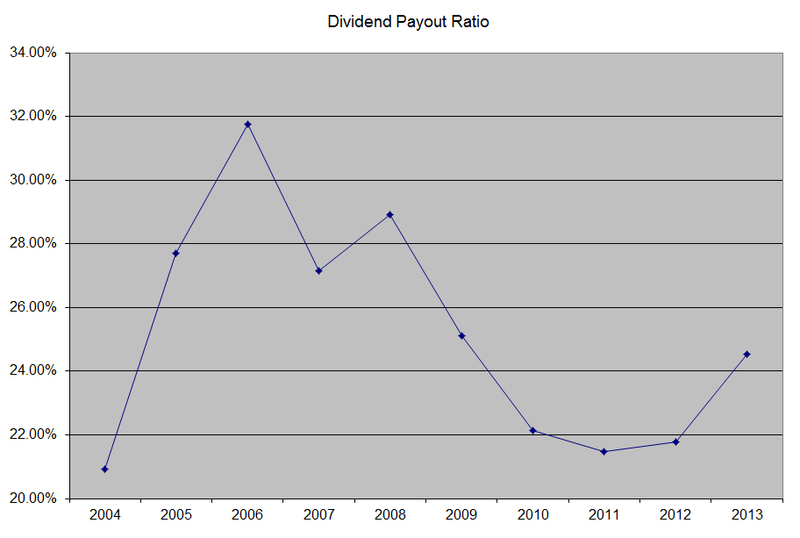 The dividend payout ratio has increased slightly from 21% in 2004 to under 25% by 2013. A lower payout is always a plus, since it leaves room for consistent dividend growth minimizing the impact of short-term fluctuations in earnings. 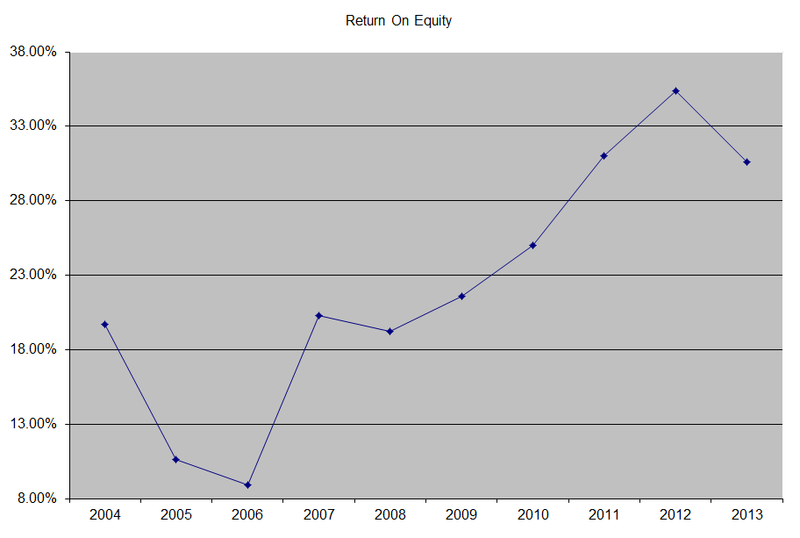 The return on equity has been on a rise from 19.70% in 2004 to 30.60% in 2013. Rather than focus on absolute values for this indicator, I generally want to see at least a stable return on equity over time. Currently, the stock is attractively valued, as it trades at a forward P/E of 17.10 and yields 2.20%. For the first six years of my dividend growth journey, I used Family Dollar as an example of a good company which was always above my buy price. Now, I would view it as a buy on dips below $50/share. However, I think growth is slowing down, there will be new pressures on the sector. As a result, I might only add there if I am out of other ideas at the time cash is available for investment.